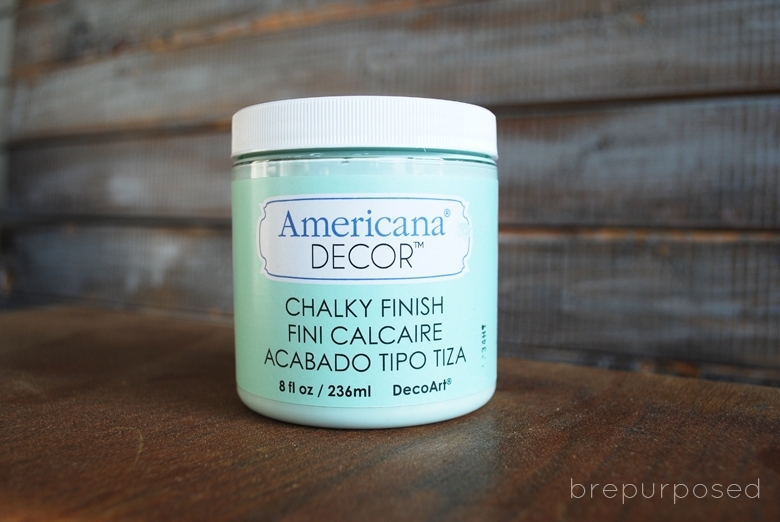 I’m teaming up with DecoArt on this one, and if you’ve never used their chalky finish paint, you’re missing out. I used the color Refreshing, which definitely speaks for itself. It’s like a breath of fresh, minty air! It looks like it’s in pretty great shape, but don’t let this photo deceive you. The top was a hot mess, the bottom drawer didn’t close, both side doors didn’t shut and the top two drawers were nearly impossible to slide in and out. Not to mention the smelly, old felt that lined the top drawer. WHY was that a thing?! (I found a pretty solid method for removing that nasty stuff which I’ll be sharing soon). It does, however have great bones and is a BEAST. Here’s proof of how yucky the top was. After the top was stained and brought back to it’s original glory, I filled the holes on the drawers with some wood filler and sanded those down to make sure everything was nice and smooth. Before painting, I made sure to clean and sand everything that needed it. Then it was time for the good stuff! I’ve never used this color before but I’m already in love. AND it only took two of these little guys to cover this whole thing. AND I did 3 coats. I love the thickness of it and how smoothly it goes on. Plus it’s super easy to distress. Now before I painted, I thought I had made sure I had sanded down all the drawers and inner edges to make sure they all slid in and out properly. Clearly I got a little too excited for the paint. I couldn’t get the bottom drawer to go back in. Womp womp. I thought it was just hitting something that was keeping it from moving, but the drawer was literally just too big for the space. How this happened I’m not quite sure, but it probably took me about an hour of going back and forth sanding the top and bottom of the drawer and the top and bottom of the inside of the buffet, before I got it to go back in. And not only did the bottom drawer not go back in, the two doors weren’t closing properly. Ugh. I called in the hubs for help but the hinges were all wonky and there was no way they were going to fit without us making them smaller. Luckily our friend has a table saw, so we ran them over to him and he shaved a bit off each one. Thankfully that did the trick and everything was back in working order. I had planned on taking pictures that day, but by the time I was done, the sun had gone down and I was out of precious daylight! The finishing touch was adding this gorgeous paper from Rifle Paper Co. and my favorite white ceramic floral knobs from Hobby Lobby. Isn’t this color so…refreshing?! I tell ya, whoever does the naming over at DecoArt is spot on. I got a little carried away with the beauty shots; hope you enjoy them! This beauty will be going up for sale, and I already know I’ll be missing it when it goes. 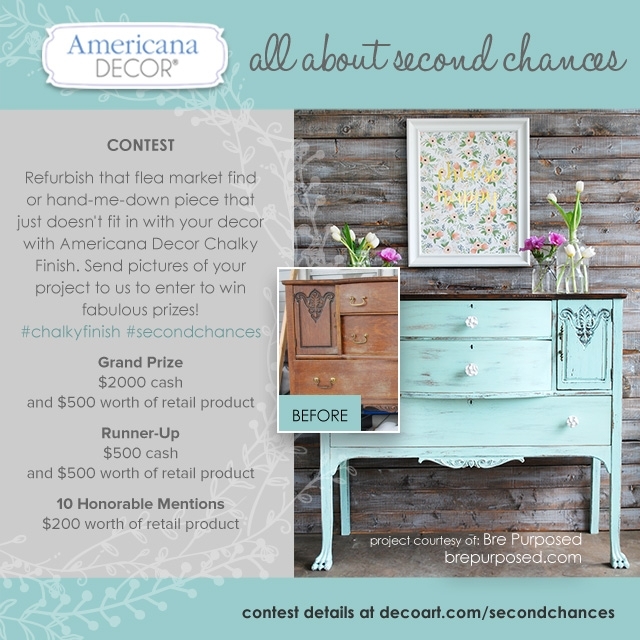 And if you’ve created a project using DecoArt’s paint, you can enter it in this awesome contest they are having! 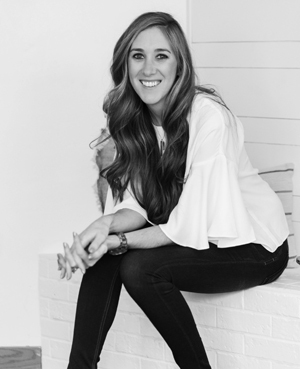 Bre, I have always loved this makeover! 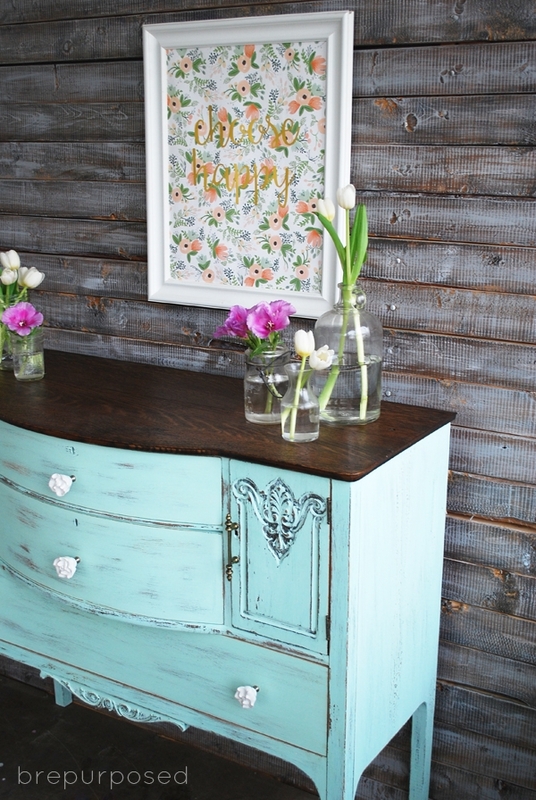 Would you mind if I feature it on DIY Furniture Makeovers? (One before, one after photo, same deal as always) 🙂 Let me know if that’s alright – thanks! 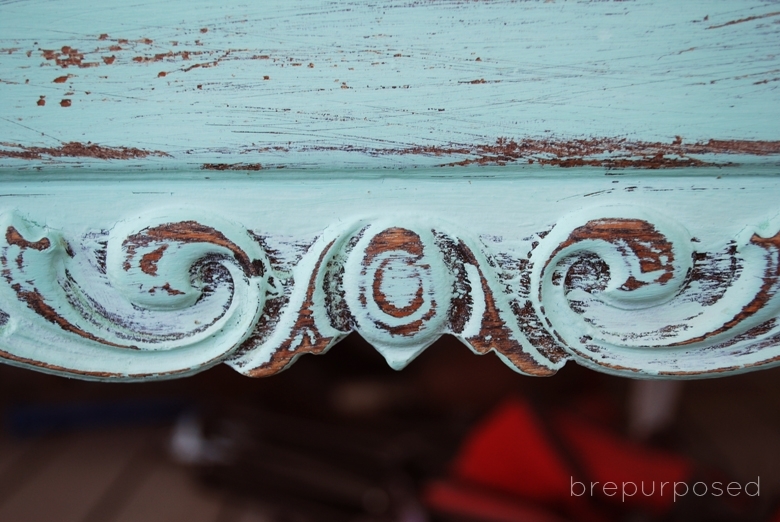 You did an amazing job….I want to try this chalk paint on my old French provincial furniture I have….I might be blind but what is this color?? Love love love everything about this, Great job. Where did you purchase the paint at? Love love love it, everything about it. Thank you so much!! You can find it at Hobby Lobby and Michaels and Home Depot! I love it. 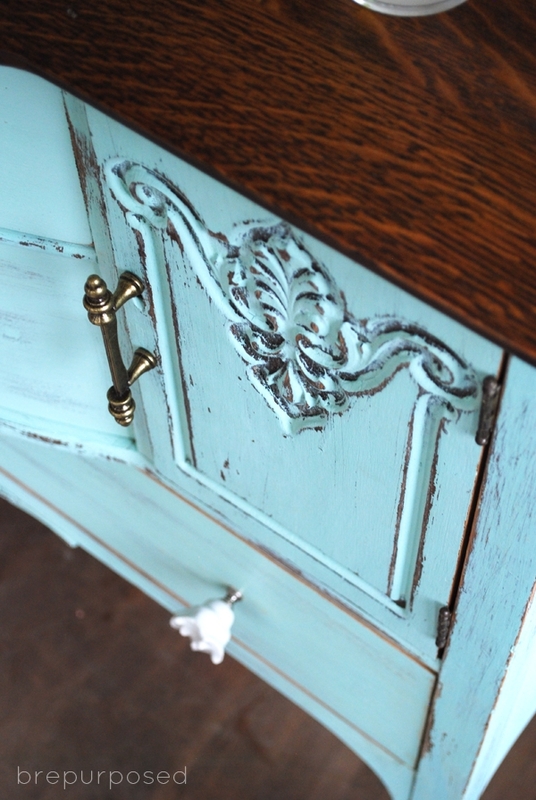 I can hardly wait to try & do something with the Chalky Finish Paint. I think I will start on a chair. Thank you! And yes you totally should, it’s great! Wow now this is the most beautiful piece of furniture I have seen yet! Great job! Wow!!! I love this! That paper is to die for! 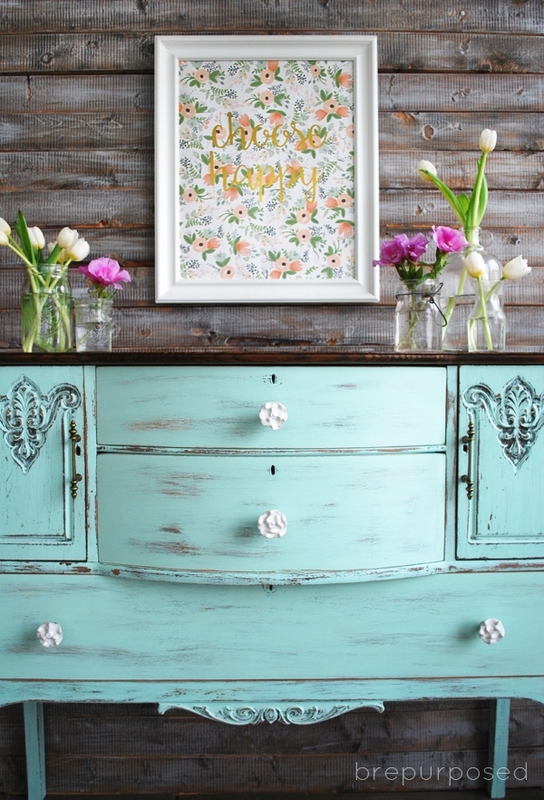 I’ve been searching for mint colors and just wondered over to this picture and I love this piece! It’s such a gorgeous color! On a totally random note I just read your bio and saw that you live in NE- such a small world bc we live in Erie. Can’t wait to read more of your posts! Would you mind explaining how you lined the drawers? I have tried and they never turn out just right. That piece is AMAZING by the way!!! Hi Traci!! Thank you so much! I’m actually preparing a post to share soon about my technique for lining drawers so be on the look out for that! 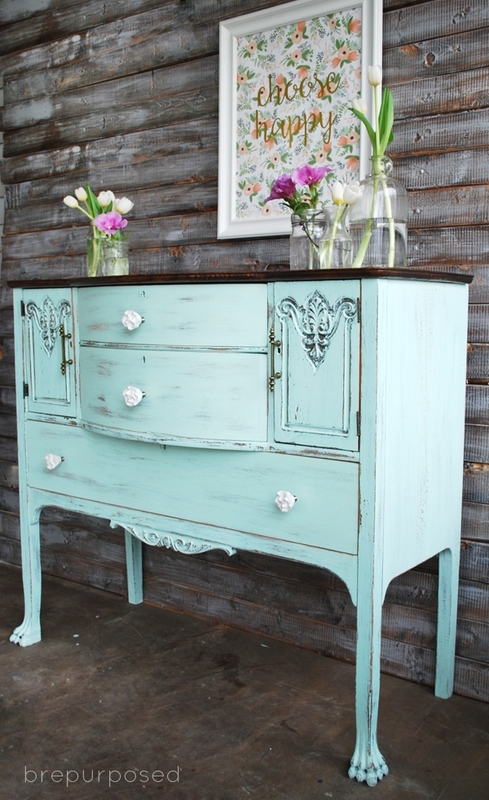 I would like to know if the stain you used over the chalk paint makes it appear more blue. The jar looks minty green in person. This is seriously my most favorite piece of yours of all time (I know I say that a lot) but I totally want to take this one home with me! Mint plus Rifle Paper Co.??!! I’m sold. This is so perfect! Such a beautiful color. 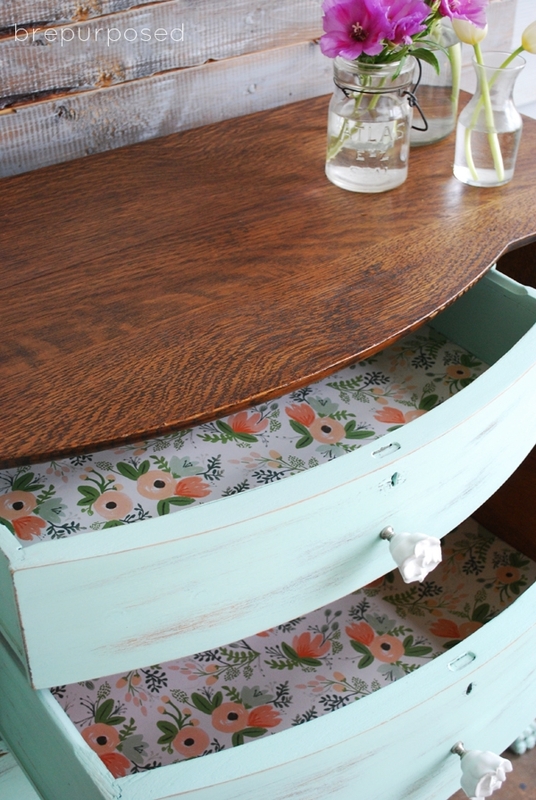 And, you even lined the drawers with the same material that you used for the frame! 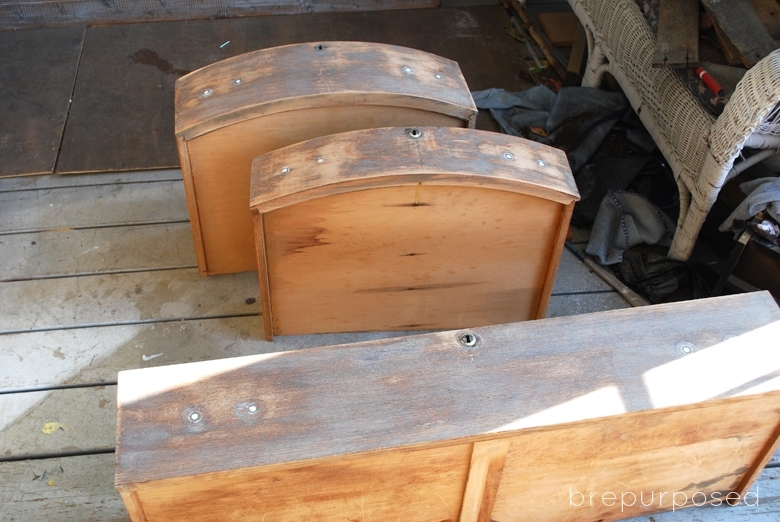 I am getting ready to paint some furniture this summer and its good to know that the drawers need to be sanded down so that they aren’t too big and go back in properly! Thank you so much Carrie! 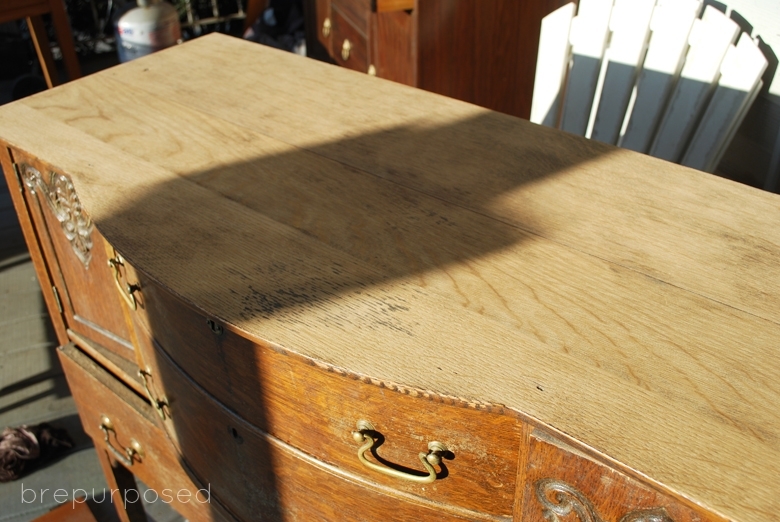 Usually the drawers are ok, but with an older piece that has warped a bit, you want to make sure they’ll fit, especially with the extra layers of paint! Love for you to share this beautiful project on Simple & Sweet Fridays. Your buffet turned out fantastic!! 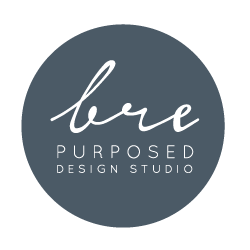 Bre, what a beautiful piece. I love the color and the stained top. You did a nice job with it. Thanks for sharing! wow it’s such a pretty piece and the colour you chose is beautiful. Hi. Love the dark accent on the raised parts. How did you do that part? With your wax or not painting heavily over these areas? I love how it turned out. I’m not sure how you distressed this piece. In the wax you used? Or by lightly painting over the raised areas? That’s the part that makes this piece stand out to me. It isn’t chippy. But the carving is highlighted. How did you achieve this? Absolutely GORGEOUS!!!! 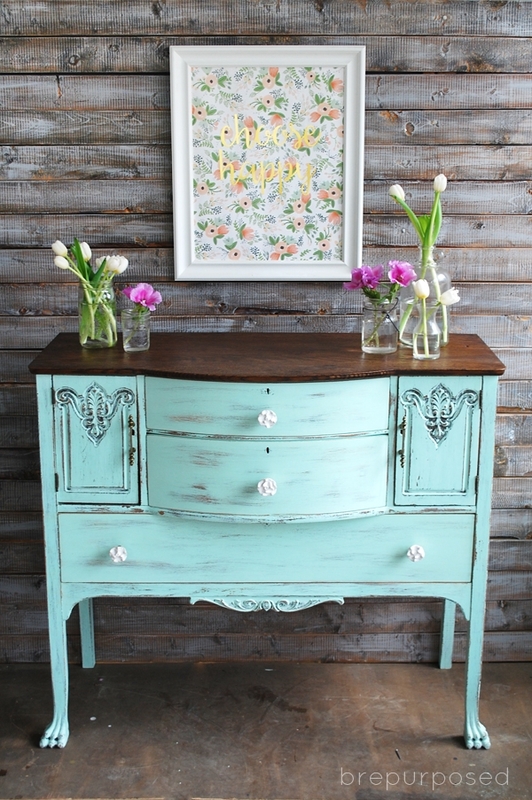 I just might have to try my hand at beautifying some of my old drab furniture!! Love this piece!! What color stain did you use for the top? Hi, lovely piece and great perseverance! 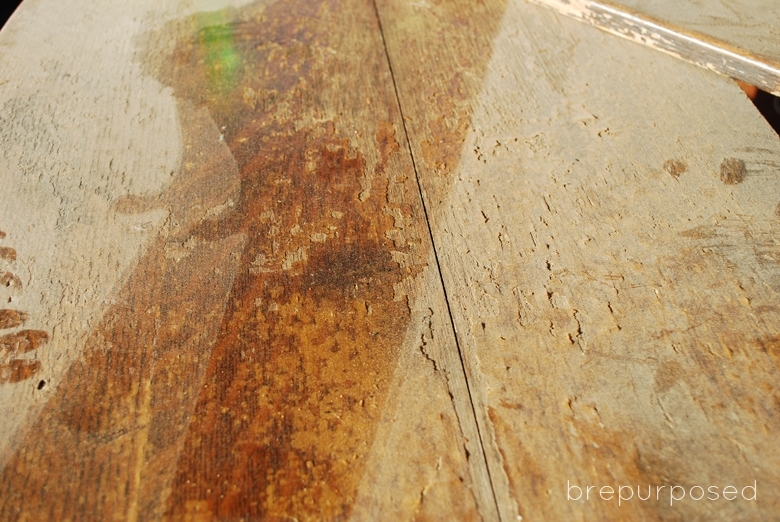 I was curious about the products you used to stain the top – what brand of stain and finish. Also, did you prep & re-stain the drawers or just paint? 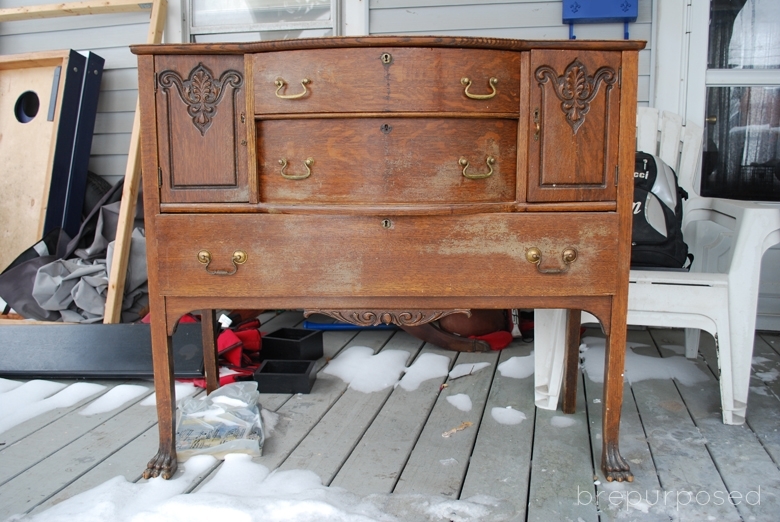 Did you apply a wax after painting the drawers/body? Hi Patti! No worries, this was a sponsored post so I didn’t want to mention other products I used. For the top I used Minwax stain in Dark Walnut. To seal it I used General Finishes Clear Satin Top Coat, but you could use any type of Polyurethane. 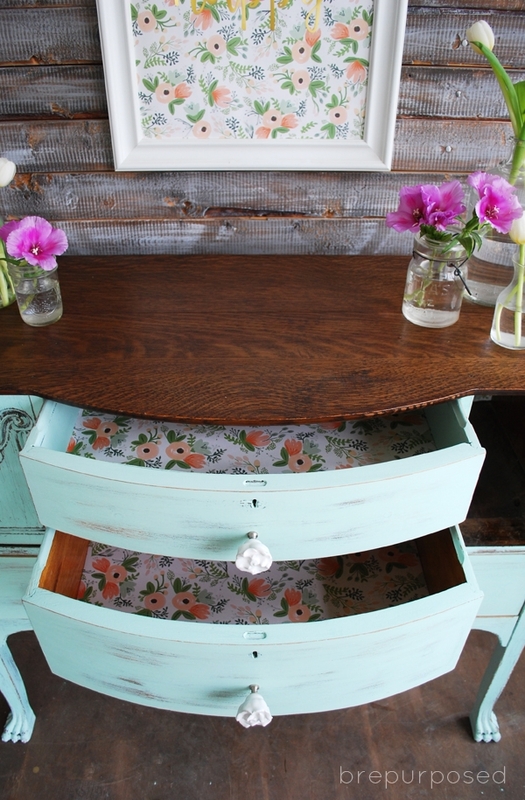 For the drawers, you could definitely just paint right over them. I sanded mine down because I filled in the old hardware holes and sanded everything down to be smooth and even again. For the body of the piece, I used General Finishes Satin Finishing Wax. You can just apply it right to a cloth and rub it on, it’s so easy to use! Let me know if you have any other questions! This one is a beauty!! I love how the top turned out. You gave it all the perfect touches, right down to the adorable paper! This is simply lovely! You may have answered this already but did you use a wax finish? Absolutely beautiful! 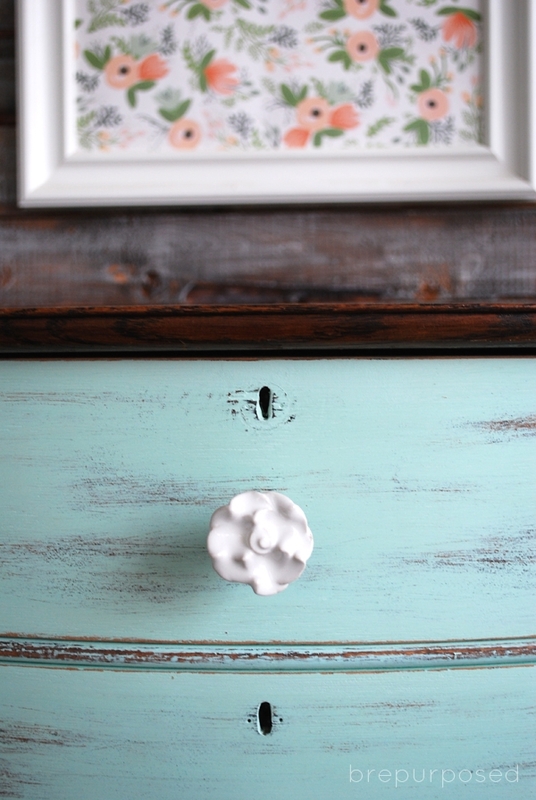 I love the color and must check out the knobs at Hobby Lobby! 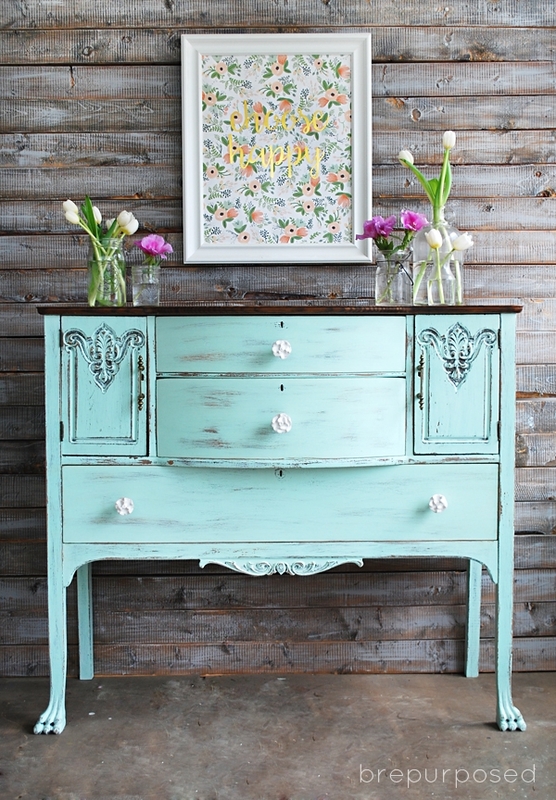 You inspire me to want to paint more furniture! Thank you so much Susan! I’m glad I inspire you 🙂 Painting furniture is so fun! Love the color with the stained top. The paper is such a fun surprise! This one is definitely one of my favorite pieces you’ve ever done! It’s perfection and I want it in my house! Wow. what a transform! Love everything!!! (except those knobs! don’t hate, sorry…I just think they stick out too far and compete…) The color is really refreshing, the paper is fun and so glad you added the warmth of the wood on top. Stellar job! Thank you!! And no worries, I appreciate your honesty!! 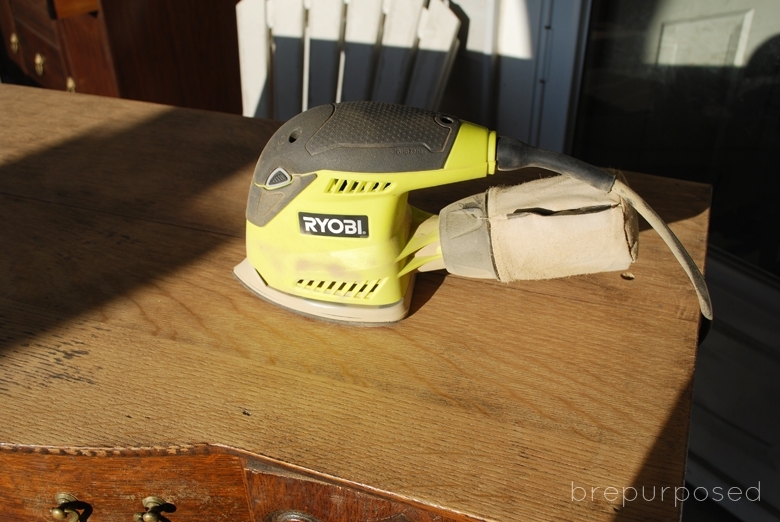 I LOVE that your besty is a sander….me too! and the same brand! Seriously this had become my favourite project of yours….that top is INCREDIBLE, you brought it back to life. I wish I could buy this one, wonder how much the shipping to Australia would be? I seriously think this is my new favorite piece that you’ve ever done 🙂 The minty bluey goodness, and OH that Rifle Paper Co. paper! SWOON. So dreamy!! Ah mine too!! I really wish I had somewhere to put it because I might shed a tear if I sell it! This is gorgeous, Bre! I love the colors and the shabbiness to it. One of my favorites so far! Thant turned out so pretty Bre!!! Always enjoy beauty shots Bre, the more the merrier! Beautiful job bringing this piece back to life again. 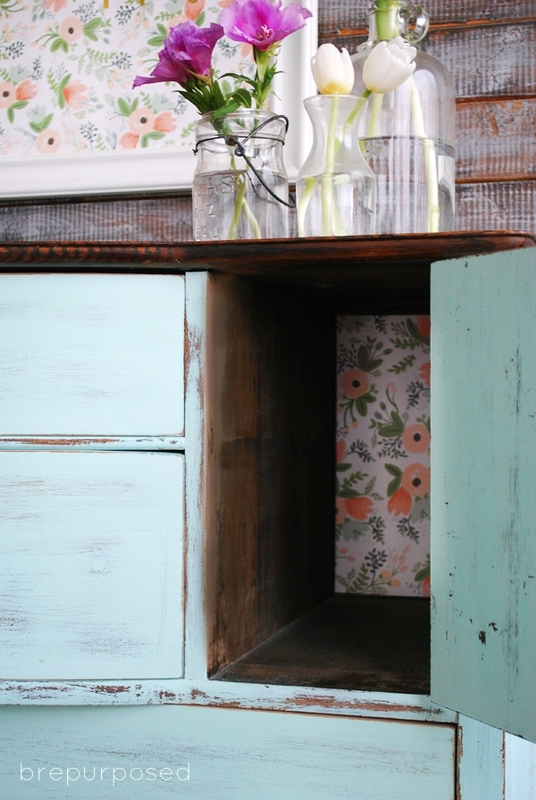 Love the color and the pretty paper you lined the drawers in. 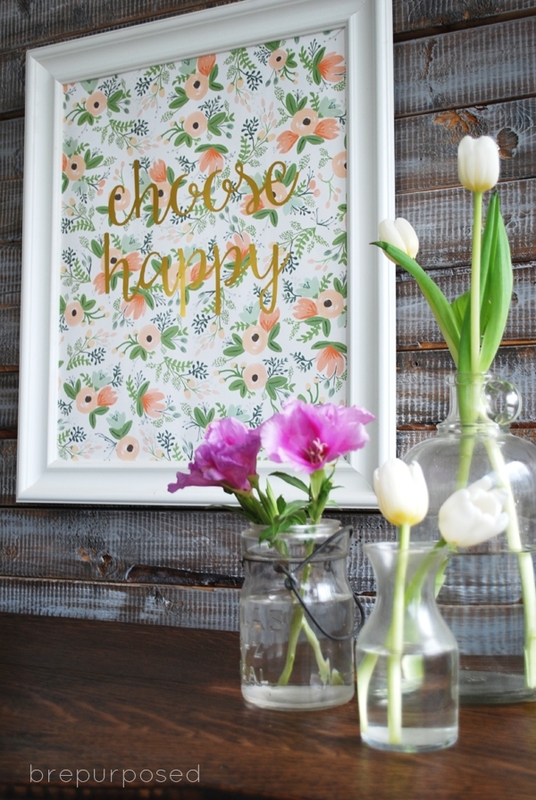 Sweet touch crafting a some pretty wall art to go with it! Bre I think this is my favorite makeover that you’ve ever done! This piece is just gorgeous. The color is amazing. I think I’m going to use it on this awesome set of nesting tables that I recently scooped up! I love DecoArt’s paints!! Great work. Aw thank you Bre! It’s def one of my favs too 🙂 And I can’t wait to see your tables! It’s stunning!!! That colour is just gorgeous and that paper …. now, I definitely need some of that in my life! SO pretty!!! such a beauty! i don’t know if it is the season, but i am finding myself drawn to traditionally “shabby chic” pieces lately (as much as i hate using that term!). 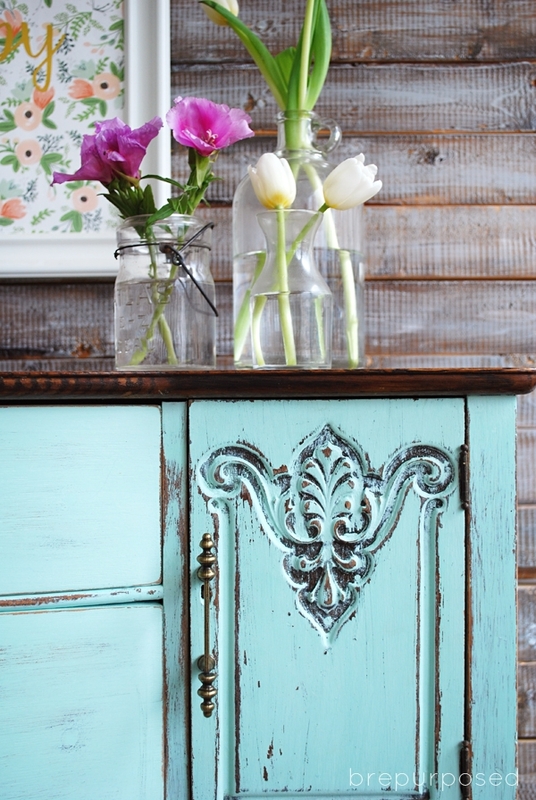 this color, distressing, and knobs- so pretty! I know what you mean! Must be the spring weather 🙂 Thanks Cassie! This color is true to the name! I adore every choice you made about this Buffet. The color choice, the paper, the knobs, etc. Perfect! Thank you so much, Heather! I’m glad it came together as well I was picturing in my head! Thank you so much Stacey! And yes, you definitely need to try it out, the paint is fantastic!